Yes, some "1995 CD" runs used the Au20 remaster, and the Zappa Patio tried to offer advise on how to tell the old from the new by looking at - not listening to - the discs. The advice focused on "matrix numbers", the little numbers around the rim of the hole in the disc (so known since the LP era). But soon, people started mailing in exceptions to every rule about these matrix numbers. It has now reached a point where the only method we can recommend is listening to the discs, and so we have removed all references to matrix numbers from the page. (Below) Russian LP with Over-Nite Sensation cover. Black back cover with track list & credits in Russian & English. What to Get: The 2012 CD should suit most people. 3) a stereo reduction made from the above. The original LP mix is used on the Au20 CD, some copies of the 1995 Rykodisc CD, and the 2012 UMe reissue. The "stereo reduction" is on all other CDs, while the original Quad mix has not, as of 2012, been reissued in any form. Original Vinyl Mix: All LP versions, except (perhaps...we're not sure) for the Old Masters LP. All cassettes prior to TZappa18. Ryko Au20 CD, and mispressed versions of the Ryko 1995 CD. Quadraphonic mix: Quadraphonic Tape and LP. Remix derived from Quadraphonic mix: Old Masters LP (maybe...can someone confirm? ), Ryko two-fer CD, Zappa Records two-fer CD, and Ryko 1995 CD; also, all cassettes since TZappa18. Only this evening, after owning Apostrophe (') for 21 years, I discovered that on the label of the record it's spelled "A'POS! TRO'PHE(!)". On the Ryko '95 reissue it's not there anymore. Some of the original US LPs included a biography as an attachment. VADIM RYBAKOV: I have A'pos! tro'phe(! )'s first USA edition with DiscReet numbers, but Reprise label. The number on the label and on the sleeve cover is DSK (2234? - maybe I'm wrong, because I haven't the record with me today), but around the label there is an MS2175 number, but it is striked out. A DSK number is around the label too. MIKAEL AGARDSSON: According to Torchum #4, there are Brazilian, Spanish, New Zealandic and Sweden issues with the Reprise label, but it doesn't mention an American issue with Reprise label. Personally, I think it's a re-issue, not an original. 1) Discreet K 59201, 1974: The label is headlined "A'POS ! TRO'PHE (!)" and has "MADE IN ITALY BY DISCHI RICORDI S.p.A." The stamped matrix number has (beside the catalogue number) "28/2/74". The back cover has "DISTRIBUZIONE DISCHI RICORDI S.p.A. MADE IN ITALY". Lyric sheet included. 2) Discreet W 59201, 1974 (1975 ? ): The label is headlined "APOSTROPHE'" and has "MADE IN ITALY BY WEA ITALIANA". The stamped matrix number has (beside the catalogue number) "12/7/75". The back cover has "Made and distributed in Italy by Wea Italiana S.p.A. Milano". The cover is printed by La Grafica Cremonese, Italy. There is no lyric sheet included (with my copy, but I bought it used). The labels of both issues say (P) 1974, but I think that the matrix number "rules". My LPs of Apostrophe (') and The Grand Wazoo have a German sleeve (made in Germany by Kinney Music), but have a Dutch label (made in Holland by NV Negram-Haarlem), and that's the way I bought them. I have an odd vinyl issue of Apostrophe ('), with a brown Reprise label and lyrics on the inner sleeve. The cover says "manufactured in US. DS 2175" but also "SIB tryck Tumba", so at least the cover is printed in Sweden. But the weird thing is that this Apostrophe (') has a Reprise label - all other editions I've seen have the yellow DiscReet label. So this was on DiscReet but probably distributed by Reprise. The special thing about this issue is the lyric sheet, which is unique. OK, mine is a promo edition, but the regular version would have to have the lyric sheet too? All the illustrations were made by Yasauo Yagi. This lyric sheet is shock-full of really weird illustrations. Each song is illustrated with a big drawing or in comic-strip form. It has a paper & plastic cover, colour front, black & white back, no spine, blue & silver label credited to FRAN ZAPPA [sic], the sound quality is great, about the same as the original, I have the I think Australian/American one. It also has no mention of DiscReet except the carvings of catalogue numbers where it is exactly hte same just with the new # on it, so it appears to be the exact same pressing, it does skip a bit every once in a while, slightly wonky, also about 1 cm smaller the normal one. Also, the front cover is slightly different - the picture is "zoomed in" a little bit more. [DiscReet CDX-2175] Pu***ased in Vancouver approximately 1980 ... The cassette version has no guitar solo in "Stinkfoot". Sides 1 and 2 follow album sequence. I had 8-tracks of both [albums]. Listening to the rear channels only, you could hear some of the music, but mostly backing vocals isolated to one or two singers. I guess those were the Ikettes. I couldn't hear rear vocals on the front channels. So, rather than saying the rear channels were ambience only, I say they held a lot of unique pieces of the music. Since at least the Rykodisc two-fer reissue in 1986, the primary version of Apostrophe on CD has been a remix, likely derived from the quadraphonic mix. This remix has shown up on three different CDs (and maybe the Old Masters vinyl), as well as on associated cassettes. While originally thought to be an easy, cut-and-dried case, it turns out that all three versions of the remix sound very different. As stated elsewhere, there is an extra measure in the CD mix of "Yellow Snow" … 'sides that, the mixes on that and "Nanook Rubs It" seem to be quite similar. Also as stated elsewhere, "Excentrifugal Forz" is mixed a bit differently on the CD. This is most obvious during the instrumental introduction, which features a less prominent violin and a more prominent guitar melody. "Uncle Remus" is mixed very oddly on the LP. The remix spaces the elements out a bit, and also snips a portion out of the ending guitar solo. ... in "Don't Eat The Yellow Snow", Zappa sings "Dreamed I was an Eskimo", then there is one measure (in 7/8 time) of guitar spewage, followed by the two-bar instrumental riff alone, followed by a repeat of the riff with the "doop-doop-do-do-do" vocal over it, then the next lyric line. The stereo LP (and the gold CD, which uses the original LP master) does not include the instrumental riff between the spewage and the "doop-doop" (so it's actually two bars we're talking about, unless you count the song in 7/4). Three different CDs utilize this mix: the original Ryko two-fer CD, the Zappa Records 1990 two-fer CD, and the Ryko 1995 reissue CD. All have slightly different variations on the remix, and sound quite different. Details are given below. [For those who are audiologically inclined, here's a quick MP3 sample of three different versions of the remix. The first clip is the Ryko two-fer, the second is the Zappa Records two-fer, and the third is the standard 1995 CD]. 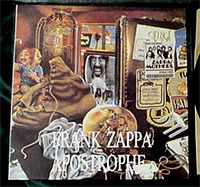 The original Rykodisc CD version of Apostrophe ('), released in the US in 1986, was coupled with Over-Nite Sensation - two albums on one CD. This was the remixed version of Apostrophe ('). Some artwork from the vinyl was apparently also missing, but this was restored on the 1995 re-issue. Is it just me or is the sound quality of the Apostrophe (') / Over-Nite Sensation disc substandard? Is is just because it is mastered at a lower volume than other discs (for example Make a Jazz Noise Here)? I noticed this through having my disc changer shuffle a 6-pack of Zappa, and this disc suffered noticably. Anyone else bugged by this? How does the LP version sound? Any other re-releases with the same "problem"? Yes, the sound volume of my Apostrophe (') /Over-Nite Sensation Ryko disc is also noticeably lower than volume of my other CDs. Freak Out!, Chunga, Zoot Allures etc. The sound volume of the ' LP (I still have one) seems to be as good as of my One Size Fits All and Weasels Ripped My Flesh LPs. In 1990, a Zappa Records version of the two-albums-on-one-CD package debuted in Europe. It sports a few differences in artwork (in particular, the front cover announces a "U.M.R.K Digital Remix," as do some other CDs in this Zappa Records series) and is not the same as the Ryko disc. There is less reverb on this version, much different EQ, and the overall presentation is louder; listen to the mp3 sample above for a comparison between the three versions of the remix. The lack of reverb on this disc would normally make it the "preferred" version of the remix on CD. Unfortunately, the Zappa Records version also introduces the "bad-batch" glitches, including a wavering stereo image and an inconsistent right channel, and some odd digital clipping. Some tracks are worse than others (e.g. Cosmik Debriz). Tread lightly. 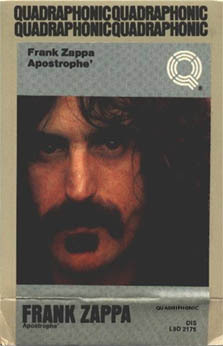 The only Zappa albums that ever came out on the minidisc format were Over-Nite Sensation coupled with Apostrophe (') (on one disc), and it's just like the original CD, but in minidisc quality, which is worse, because the disc is so small that the audio data has to be compressed to fit on it, with a lossy compression scheme. Presumably, this uses the 1986 Ryko digital master. Ryko's 1995 CD reissue uses the remix of Apostrophe; it also restores some artwork. Sound-wise, it's closer to the original Ryko CD than to the Zappa Records CD. There is one major difference: thanks either to the EQ used on this disc or some extra processing, it sounds like there's even more digital reverb on this disc. Check the MP3 link above to hear the difference. AT SOME POINT, the master used to create the standard 1995 CD was briefly swapped with the master used to create the audiophile, Au20 gold disc, which uses to the vinyl mix. We used to have a whole guide here about how to tell the difference between issues, but there were so many exceptions (mostly involving matrix numbers) that we've dropped the discussion. See below for a write-up on the Au20 disc. Nobody seems to know anything about the Au20 swap, SO DON'T EVER MENTION IT AGAIN! Ryko issued Apostrophe (') and One Size Fits All, in "limited" (numbered) editions, as expensive audiophile gold CDs - the discs used gold instead of aluminum. You may want to argue that gold itself would not make a compact disc sound that much better, but both discs were made from improved master tapes and sound much better (on good equipment). The gold may be mostly a gimmick to warrant the higher price necessitated by the major time and effort spent to prepare an extremely good master. The master used for this CD was of the original vinyl mix, not the remix that was on the original CD, the Zappa Records CD, and the most runs of the 1995 CD. Some time after this gold CD came out, Ryko switched to using this same master for new runs of their 1995 CD. The Au20 CD was mastered from the original dolby A master tapes. Playback was through a specially enhanced Ampex ATR-102 using audio cards by J. Musgrave and courtesy of the Complex [?] recording studios. No equalization, compression, limiting or any other "enhancement" of any kind was added during the transfer. The analog-to-digital conversion was done through a dB technologies AD122 converter in the 20-bit mode, directly to the hard disk of the Sonic Solutions digital mastering workstation. Once edited in the final form the program was transferred through the Sony super-bitmapping process integrated into the sonic system. This noise-shaping process allows the music to be captured in 16 bits while maintaining the optional signal to noise equivalent of 20 bits. This superbitmapped master was then used in the production of the Au20 CD. DAN WATKINS: I was listening to my Au20 CD of Apostrophe (yeah, screw anyone who bought the regular CD after the Au20 switch) and noticed something weird right at the beginning of "Cosmik Debris". Right before the 00:01 mark, there's a weird tape warp or something. I compared this to the '95 CD, and it isn't there. Anyone else notice this? I'm sure that this isn't something that just happened on my CD. ZOMBY WOOF: Please detail the symptom ... is it like a "this tape has been eaten" sound? DAN WATKINS: Yeah, it's like the speed changes for a quick nanosecond. I've never noticed this on any other copy of the album. I went back and checked the LP, and I don't hear it there either. Maybe it's just the way that guitar note is played, and the clarity of the Au20 CD is letting me hear it for the first time? I don't know. It just sounds kind of funny. BIFFY THE ELEPHANT SHREW: I finally got around to checking this. Yep, it's there. LEWIS SAUL: I don't hear it. What are you talking about? I hear George laughing at the end of "O'Blivion" and then "Cosmik" kicks in - I don't hear any tape warp. I can report that the Japanese paper sleeve edition of Apostrophe is not the AU20 mix - I have both, and there are substantial differences between the mixes, including the different track lengths etc. The Japanese version is the same as the widely available current Ryko silver CD. In the case of "Apostrophe (') the better sounding Au20 CD has a weird tape warp or something right at the beginning of "Cosmik Debris", right before the 00:01 mark - but this is not on previous CDs like the 1995 Ryko CD. The good news: This tape warp is NOT present on the new UMe 2012 CD. FATHER O'BLIVION is missing the apostrophe (now making it FATHER OBLIVION) two times in the packaging. in gz's 'note' the (') is included. Also, the Ryko version of Apostrophe (') had the lyrics printed, the new version does not. Any points to make about the Old Masters version? Any details on the Russian CD? Was there an MS2175 vinyl? Can someone confirm that all "modern-era" cassettes use the remix?